Maybe it’s because my monthly friend is here, or maybe it’s because I am still waiting for the promises of God to come into fruition- but this week has been hard. Monday went well! I began my day with a beautiful walk around Baker Park and Carroll Creek, here in Frederick. Then I came home, wrote, read, and thoroughly enjoyed my day. Tuesday was cool- honestly, not as awesome as Monday, but good enough. But then Wednesday came and I just haven’t been the same since. Some potentially disappointing financial news arrived, and I have been contemplating and reevaluating every decision of my whole life since that moment. Why did you change from being a Psych major? Was the masters really worth it? You wasted time and money…with nothing to show for it. Pleasing other people got you into debt and depression. Many thoughts have been running frantically through my mind, causing me to pull farther and farther away from the rest of the world, and closer to my core self. The only issue is, in 24 years of battling mental health issues, I have not learned how to pull away from everyone and still remain close to God. I have run the entire gamut of emotions this week as I “patiently” wait for God to move in my life. All of this emotional running has left me exhausted and sent me right back into my reclusive nature. Remember, I lived in my mother’s tiny womb, all by myself for 40 weeks… I am used to being alone… and pulling into myself is how I tend to cope with difficulties in my life. This is NOT a healthy method, and I fully realize that, which is why I am sharing…to help set someone else free. My occasional act of reclusion is healthier than what I used to do, but it is still not good. I fight emotional battles every day just to open my door and live my life, but I press on because I know God has called me to do so. As I have mentioned before, I do know exactly what God has called me to do with my time on earth. He has clearly and explicitly stated what my life’s purpose and mission will be. So, what’s the issue? His time is not my timing…and I want Him to move NOW. Yeah…unfortunately, God does not move according to my timing, but instead in His own perfect time. So as I sit on the proverbial bench of life, I must watch and wait, as God has things that He needs me to learn and witness before it’s my time to step onto the field (in my mind I am the greatest running back of all time, working diligently for the MVP quarterback, God). So today as I am sifting through all of my emotions, I began preparing my meals for tomorrow since I will be in Baltimore all day. As I was preparing my smoothie ingredients, I looked in my blueberry container and saw something that was not blue- it was a green blueberry. And right there, as I looked at the green blueberry in a blue sea of berries, I realized that that green berry was me. God has called me to be the different person in a sea of similarities. In fact, it is because He has called and set me apart that He won’t let me quit and give up when life gets too hard. God has brought me entirely too far and through too much for me to just give up now because I received potentially bad news. He has carried me over one too many mountains just to see me quit as I walk through a valley. He has listened to and answered too many prayers on my behalf for me to just walk away from what He has in store for me. If you have never asked this question before, I’m sure you are asking it today: what makes me capable to advise others when, clearly, my life is not perfect? Well, that’s what makes me capable to advice others, because my life is not perfect. If my life were perfect and I never faced (and shared) issues and troubling experiences, would you know that you, too, could overcome whatever you may be facing? Would you know that God could meet you were you are and help you through the good and the bad of your life? Would you know that even if you walk righteously for so long and then stumble, that God was still there to catch you and restore you? If my life were perfect would you know that God could heal the brokenhearted and comfort the crushed in spirit? 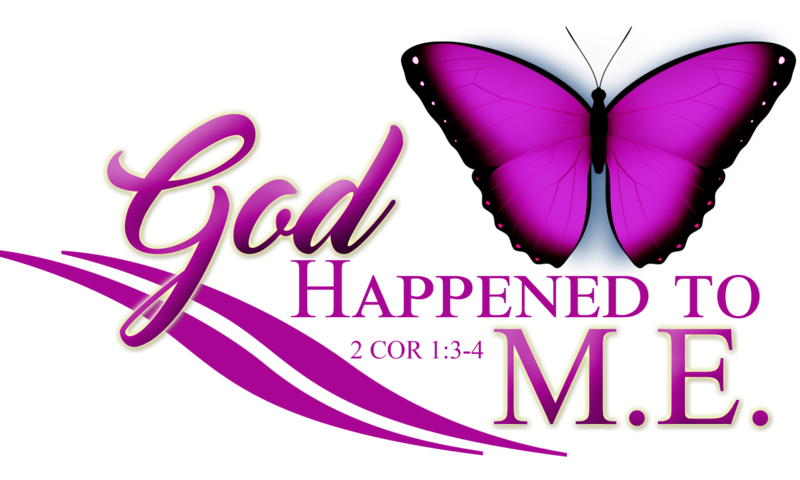 Beloved, when I say that God happened to M.E., what I really mean is “God is still shaping my life and using it as a lesson and blessing to others.” Unfortunately, that sentence does not look too pretty as a logo. When I gave God a YES, I promise you that I thought all of my problems would disappear and everything would be butterflies and cotton candy. Well, cotton candy melts and butterflies start off as not-so-attractive caterpillars, who must go through many levels of change and growth before becoming beautiful butterflies. And that’s ok. I am learning to accept the hills and the valleys that come with following Christ, as I know that He walks with me through it all. I wanted to share this message with you today because I wanted to encourage you to press on. Christ has already extended His hand to walk with you and now I am extending mine as well. I want to walk with you (for purely selfish reasons) because it is harder to quit when you know someone else is with you. So, if you walk with me and I walk with you, we will both walk together with Christ. Join me on this healing journey; it really is a bumpy road- filled with twists and turns- but Christ walks us through it all. Pingback: Focus… – God Happened To M.E.